In the early morning of Wednesday the 15th January 2014, at 3:45 AM, the muezzin of the Deir Istiya village went from his home to the Abu Bakr mosque west of the village in order to prepare for the first prayer. He found the entrance to the mosque on fire. He immediately brought water from his home in order to douse the flames. When the fire was under control, he announced over the loudspeaker of the mosque for all the villagers to come and see what had happened. 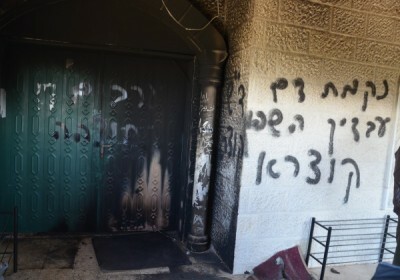 The villagers witnessed graffiti in Hebrew lettering at the entrance of the mosque; they also found gasoline containers which had been used and empty spray paint canisters. The graffiti said: “Our blood has been shed and we will take revenge for Qusra,” “ In memory of Qusra” and “Arabs Out”. In February 2013, Settlers had attempted to burn the same mosque which was built in 2005. The guilty parties were never found. 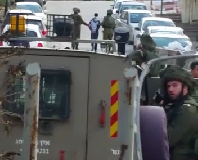 The Israeli border police and Israeli soldiers arrived at the scene at 6 AM. They took pictures of the mosque, including the graffiti and the burned entrance. They took the gasoline containers and spray paint canisters into evidence. On the land between the west of the village by the mosque and the settler road the police found a mobile phone which is believed to belong to one of the settlers, lost on his or her escape. This was also taken into evidence. 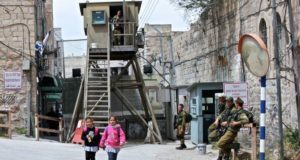 The evening before the incident, Israeli forces entered the village of Deir Istiya; they then set a curfew not allowing any of the villagers to leave their homes after 10 PM; the residents then witnessed the soldiers shooting flares and throwing stun grenades. Nobody knows exactly when the Israeli army left the village. The residents believe that the Israeli soldiers prepared everything for the settler attack to avoid eye witnesses on the streets. On the settler road by the junction to the illegal settlements of Revava and Yakir, there is an Israeli army jeep parked at all times in order to protect the settlements; there is also a camera tower, which monitors the street, the field up the hill and to the mosque on the edge of the village of Deir Istiya. However, when a villager arrived at the mosque that morning, he noted that the army jeep was not in its usual position; he speculated that the soldiers left that area in order to allow the settlers free access. Due to the surveillance camera which monitors the street, in addition to the evidence collected at the scene: the mobile phone, the gasoline containers and the spray paint canisters, it would appear to be straightforward to find the criminals who burned the mosque. Villagers believe that the Israeli forces do not want to find the settlers responsible. On the 7th January 2014 Palestinians from the villages Qusra, Jalud and Qaryut defended themselves against attacking settlers. The settlers were beaten and held until the Palestinian DCO handed them over to the Israeli army. Because of the graffiti on the mosque, the villagers of Deir Istiya believe that it was a revenge action from a group of angry settlers.